This cape will work for any type of hero from Avenger to Little Red Riding Hood – one size fits most. It can be made with a collar, a hood, or without either. My grandmother Inge is my creative superhero – amongst other fun things, she taught me how to knit and crochet, and still knits and paints herself. This pattern is dedicated to her on her 88th birthday. Happy Birthday, Omi! 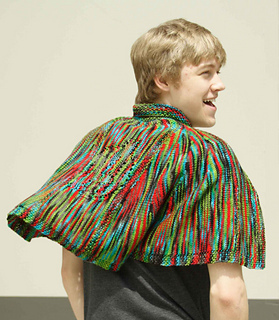 The cape is a fly-away style that closes at the neck, but the bottom edges do not touch at the front. It can be made with a collar, a hood, or without either. 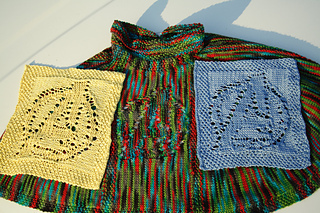 If you want to subtly show off your Avenger Fan-ness, you can knit the optional ‘A’ logo lace panel with the center back. 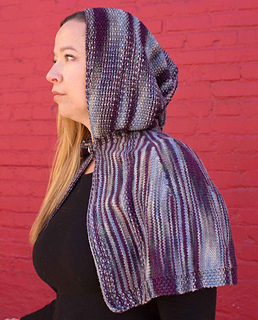 The cape can also be modified for more coverage by adding more short rows for both shoulders. Please be aware that this will require additional yarn. The collared sample is in ‘Assemble!’; the sample with the hood was made in another limited edition color called ‘Craigh na Dun’. Unfortunately, both are now sold out, but two quite similar permanent colors to ‘Craigh Na Dun’ are ‘Twilight’ and ‘Black Purl’.